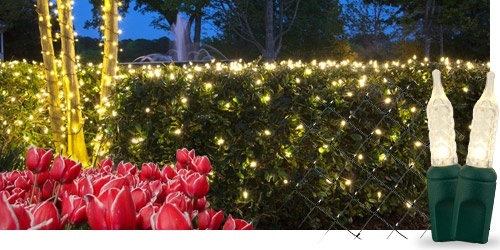 What better way to commemorate the glory of Easter and the vibrance of Spring than with light! 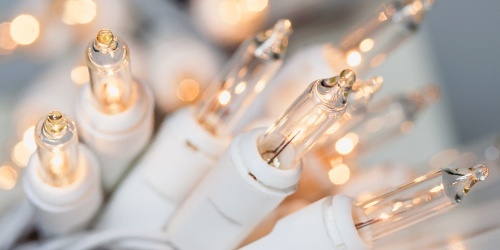 From pastel string lights to special Easter craft decorations, we've assembled our most cheerful array of Easter lights to make your holiday joyous. 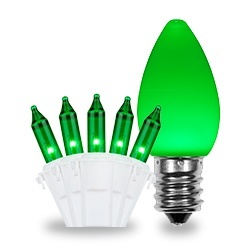 Easter lights are popular decorations for parties, churches and Easter events. 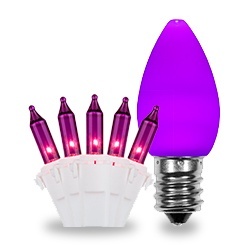 Opaque lights in pink, yellow and purple give off a pastel glow in the colors of the season. 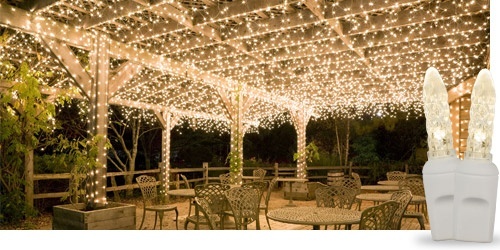 LED mini lights or incandescent mini lights strung in bushes and along party tables make festive Spring decorations, and cute glass ball ornaments can be used to resemble Easter eggs. Need more fun Easter decorating ideas? String pink, teal and purple lights in a tree hung with pastel glass ball ornaments (or plastic Easter eggs) to create an Easter floral or foliage decoration that blossoms with color day or night. Lace dainty, battery-operated fairy lights through your child's Easter basket for a magical touch your kids will love. 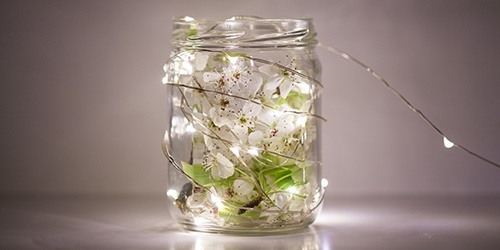 Display cheerful Easter string lights in classrooms or hallways at church to celebrate the joy of Easter morning. However you use them, our Easter lights are sure to breathe new life into your favorite Easter traditions! Here's a fun DIY Easter decoration that will make your kids smile . . . 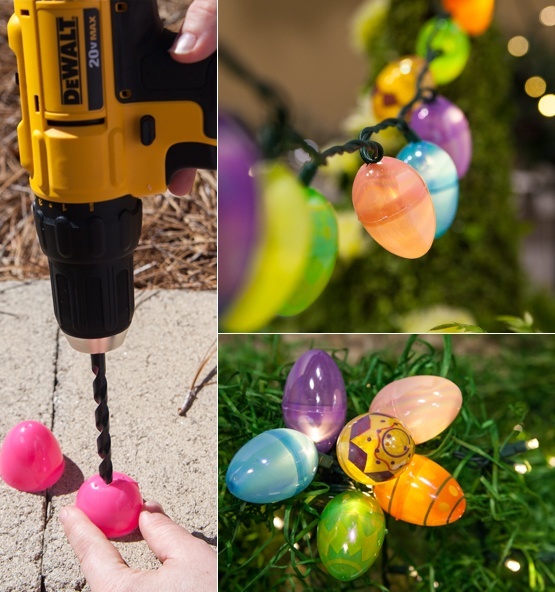 This easy-to-make Easter craft can turn any strand of mini lights into festive Easter Egg Lights in just minutes. First, drill a small hole in the bottom of each plastic egg. Choose your drill bit to match the widest point of your light (we used a 5/16 bit for our 5mm LED mini lights). You may want to drill a small guide hole first to help your larger bit get started. Apply minimal pressure as you drill, and note that you may get some minor cracking. That's OK . . . see below. 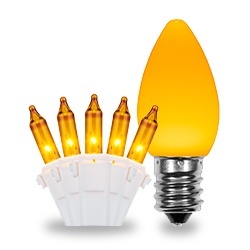 Next, simply work the plastic Easter egg over a bulb on your mini light string. You can gently squeeze any minor cracks to open up the hole and help the bulb go in more easily. That's it! Just repeat these steps for however many lights and strings you want, and you're done. You can have strings and strings of multi-colored Easter Egg Lights to brighten up your Easter celebration, all in just minutes. Happy Easter!